THE READERS RAG: "THE SECOND GIRL": A NOVEL ABOUT SECOND CHANCES! "THE SECOND GIRL": A NOVEL ABOUT SECOND CHANCES! Frank Marr is a decorated, former cop gone rogue. One night he is engaged in raiding a drug infested flop house to find drugs for himself--his drugs of choice are cocaine and pills--when he stumbles upon a young teenager chained up in the bathroom dressed solely in her underwear. He rescues the girl and brings her back to her family and continues on his way. But lo and behold, there is another missing teenage girl who came from the same neighborhood. Her parents are desperate to have Frank Marr locate their daughter as well even though the trail of clues have pretty much dried up for the case. Is Frank Marr up to the task? Time will tell! David Swinson is represented by Gelfman Schneider/ICM Partners Literary Agency which represents Oliver Sacks, Emily Barr, Jacqueline Mitchard, Tracy Chevalier, Lauren Weisberger, Lisa Jewell, and Connecticut's own, Gina Barreca. To a certain extent, when I look at books, I take a bit of an interest in the author's journey to publication. For those who are interested, this is how is went with David Swinson. After retiring as a police officer, David Swinson then self published a mystery, suspense book entitled "A Detailed Man" in 2011. Somehow between 2011 and 2016, Mr. Swinson was able to transform the quality of his work to the point where it was appealing to a mainstream publishing company. 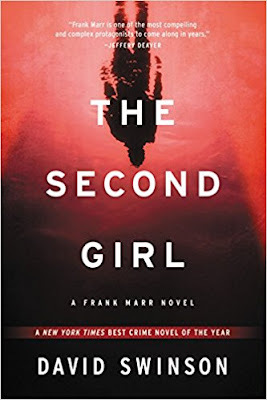 Thus, this book, "The Second Girl" is published by Mulholland Books, a division of Little, Brown & Company in 2016. 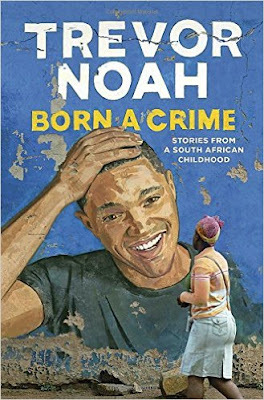 Immediately on the heels of this book, on May 2, 2017, Mr. Swinson also published a sequel entitled, "Crime Song", also starring his disreputable detective Frank Barr. I suspect that some of this considerable progress is the result of Mr. Swinson's hard work and effort. In addition, his colorful history as a rock concert promoter, music video and film producer and his association with such big names as Dr. Timothy Leary and Hunter S. Thomson probably had a good deal to do with it as well. Clearly, he knows how to work with a marketing and publicity team and how to focus in on content that will sell. In addition to content, I think that the cover design of the book has played a big role in its appeal. This cover design is by Keith Hayes and the photograph by plainpicture/Tim Robinson. I find it striking that David Swimson has been able to attract the support of a cover design artist as notable as Keith Hayes. Personally, I think it was worth the effort to get him on board because I'll be honest, the cover design was what initially attracted me to the book on a table full of mystery novels. The bright orange color combined with the mysteriously distorted, dark watery upside down figure figure of a person immediately got me interested. I just had to reach out, grab the book, and flip to the back side to read the blurb. So the book had me at "hello" just with that first visual tug at my curiosity which was a direct consequence of the cover design. At this point, I'm sure you are curious regarding what I actually thought of the book. When it came down to it, this book did not disappoint; it was very entertaining from beginning to end. It maintained a very consistent viewpoint and pulled me in with great dialogue and lots of action. On the down side, as another reviewer has mentioned, it does not seem credible that the protagonist, Frank Marr, could have maintained such a high level of drug and alcohol consumption without messing up somewhere, no matter that he was a highly trained cop. It also doesn't seem credible to me that he was able to get away with some of his more disreputable fast moves. I don't want to get into the details of what those are since I don't want this review to contain spoilers. But trust me, it gets pretty dangerous out there on the mean streets of Washington, D.C. and Frank does some pretty iffy things. Another aspect of the novel I find troublesome is its frankly racist undertones. For instance, all the villains are either black or Hispanic. I just don't think the world is like that. And it is clear that Frank Marr considers them all a waste of space, that there is nothing at all redeemable in any one of them. While I assume that David Swinson is trying to balance that impression out by showing how the white suburbs are infested with drug hungry, amoral teenagers who are only too happy to abuse substances, somehow it doesn't come across as equivalent. Clearly, Frank Marr considers those teenagers redeemable since he goes to such lengths to restore them to their families and presumably to a round or two of well paid for rehabilitation clinics not available to his nonwhite protagonists. I'm also not happy with the rather flat personalities of the teenagers and their parents. You never get underneath the surface of these people. Why did their children get into drugs and bad company? Something must have caused that, don't you think? Without a reason or a hint at the basis for these kids to get involved with criminal elements, it all seems very sordid and tawdry, to the point where you think these kids are hardly worth the trouble of saving when you get down to it. When you don't really care if the victims get rescued, well, you've lost the point of the entire rescue narrative. I guess what compensated me for this gaping flaw was the fact that I was engaged in trying to figure out whether Frank Marr would rescue himself in the course of trying to solve the case. So this book has some good aspects, some bad, some strengths and weaknesses. What saves it from the trash is that it has some great flashes of brilliance amid its periodic banality. What this adds up to, in the end, is that the book is a great read, and I'm here definitely recommending it to all of you. As for the sequel, I haven't read it yet, but I'm hoping it is even better.